If your child loves Yugioh characters and plots, then Yugioh birthday party would be an ideal theme for his or her birthday! Take a look at various party ideas below to help your party planning. Make Yugioh birthday invitations using theme coloring pages. Simply make enough copies for all the guests. Fold the coloring pages in half. Have your child color the images with crayons or markers. Include all your Yugioh birthday party details inside. As a variation, you can get blank white invitation cards. Write party information on the cards, and put theme stickers all over them. Place the invitations in envelopes and mail. Lastly, you can create Yugioh party invitations in a shape of playing cards (“Egyptian God Cards”). Use your imagination to decorate the back side of the cards. Include all the party details on the opposite side. Best colors for your Yugioh birthday party decorations are blue, purple, red, and yellow. Be sure to have lots of balloons and streamers in those colors throughout the area. Play Yugioh party music CD in the background. Tape images of various Yu-Gi-Oh! characters on the fence. Make a balloon arch by tying balloons to a kite string (about 12″ apart). Place the balloon arch at the driveway entrance. Kids will love the idea of going through the arch. Use as many Yugioh posters as you can to create theme atmosphere inside your house. Decorate the hallway with paper streamers. Spread out various Yugioh toys on the floor and furniture. Hang a personalized “Happy Birthday” banner in the area. Cover your Yugioh birthday party table with a theme cloth. Place Yugioh Mylar balloon in the middle for a centerpiece. (Use some sort of a weight to keep it in place.) Tie colorful helium balloons to the chairs. *Yugioh Coloring Pages: Spread out Yugioh activity books around the party area. As the kids arrive, provide them with crayons and markers, and have them color the pages of activity books. 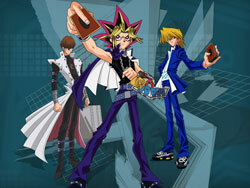 *Yugi Jigsaw Puzzle: Glue a large image of Yugi onto a cardboard or sturdy poster board. Draw jigsaw puzzle shapes with pencil, and then cut them out. At party time, invite your Yugioh birthday party guests to work as a team to solve jigsaw puzzle. *Sandy Candy Party Activity: You can get Sandy Candy Activity kit from a party store, and have the kids make colorful candy concoctions while they are waiting for others to arrive. For Yugioh birthday party favors, include such items as glow sticks, laser spinners, Pop Rocks® candy, Yugioh stickers, and so on. At game time, attach Yugioh character name to every person’s back, but don’t let them see the name. *Balloon Dueling: Instead of battling one another for a prize, entertain the kids with individual balloon matches! To prepare for the game, insert small, lightweight party favors (such as stickers or small candies) into the openings of several balloons before inflating them. Make sure you have a balloon for each child. When the Yugioh birthday party guests are ready to duel, give an inflated balloon to each player. Tell the kids that they must defeat their “opponent” by sitting on it, jumping on it, squeezing it, kicking it, etc. Time each person individually to see who can defeat his or her opponent in the shortest amount of time, or organize a collective duel where everyone battles their balloons at the same time. For added fun, write the names of Yugioh monsters and evil characters on the balloons with permanent markers. The kids will have lots of fun trying to defeat their opponents and will love the great surprises they will find inside the balloons! *Yugi, Yugi, Marik: At Yugioh birthday party, a traditional “Duck, Duck, Goose” game turns into “Yugi, Yugi, Marik.” Play the game outdoors, but if you decide to play indoors – make sure that you have lots of space. *Monster Creation Craft: Cover your craft area with a large plastic cloth. Provide a variety of modeling clay to the guests. Invite them to use their imagination to create their own Yugioh evil monsters to take home. *Yugioh Race: Divide the kids into two teams. Line them up on one side of the play area. On the other side of the play area, place two chairs across from the lines with boxes on top filled with theme-related items (just enough for all relay legs). On the command “Go” the first players on each team run to their designated chairs and pick one item from the box. Next, they run back, place those items in a box (located just to the side of their line) and tag the next players on their teams. The first team to “transfer” all the Yugioh items, wins! *Pin the Card on Yugi: For this Yugioh birthday party activity, you’ll need a large Yugi poster and construction paper card-shapes (enough of everyone). Mark the cards with each guest’s name. At game time, blindfold the children one by one, spin them around, and get them to stick their cards on Yugi’s hand. Carefully cut the picture into eight equal pieces, and write clues on the blank side (opposite side that the picture was drawn on). The first clue should lead to the location of the second clue, and so on. The last clue should instruct players to put all the clues together, flip them over, and arrange them like the pieces of the puzzle. Make sure that you hide the clues and treasure before the children arrive! *Card Tournament: Challenge the partygoers to a game of cards! If all the kids are not familiar with the Yugioh card game, choose a few different child-friendly card games (Crazy Eights, Animal, Ninety-Nine, Spoons, etc). Play a practice round every time a new game is introduced so everyone understands the game rules. Let the children play each card game at least once, and award the winner(s) of each round with Yugioh trading cards or small theme-related prizes! *Magical Adventure: At the end of the party, let the kids watch Yugioh show to unwind. It’s a perfect way to occupy your guests while they are waiting for their rides! *Yugioh Cake: Bake a 13×9″ sheet cake. Frost the entire cake with white frosting. Find a picture of Yugi, and cut the image out to use as a stencil. Lay the drawing on top of the cake to outline the head onto the cake, using a toothpick. Remove the drawing, and draw the hair and facial features with toothpick using the picture as a guide. Frost Yugi’s face gently with a cake decoration knife. *Monster Eggs: Hard-boil 8 eggs and run under cold water. Crack and peel carefully. Divide 1 lb of breakfast sausage in 8 equal portions and flatten each into 5″ round patty. Wrap a patty around each of the hard-boiled eggs, covering them entirely. Then beat 2 raw eggs in a bowl. Brush each sausage-wrapped egg with a beaten egg. Roll wrapped eggs in crushed saltine crackers. Arrange eggs in a shallow dish and bake for 25-30 minutes, or until sausage is no longer pink. *Edible Game Cards: For this Yugioh birthday party recipe, you’ll need at least 2 graham crackers for each child, 4 cups vanilla frosting, small candies, sprinkles, food coloring, and small plastic bags. Remove one layer from each graham cracker to create a card shape. Frost each graham cracker card with vanilla frosting. Divide the remaining frosting into 1/2-cup portions and tint with food coloring (making sure to mix color well). Place each portion of colored frosting into a resealable bag. At decoration time, cut off a bottom corner of each bag to form a small hole. Squeeze bag to pipe frosting onto the cards. Use small candies, sprinkles, and other tiny confections to decorate as well. *Fruit & Veggie Tray: Slice carrots and spread celery sticks with peanut butter. Arrange on a tray with olives, cherry tomatoes, and other vegetables that your child enjoys. Cut up honeydew, watermelon, or cantaloupe for a fruit platter. Add slices of apples, strawberries, bananas, grapes, oranges, and more! *Marik’s Poison Punch: Before the Yugioh party, purchase plastic ivy from a craft store and cut it into several pieces. Make ice cubes using lime Kool-Aid® and add a piece of ivy to each ice cube compartment, and freeze. On the day of the party, tint lemon-lime soda with green food coloring and add “poisoned” ice cubes. Your guests will be delighted with this dangerously fun drink!